Rent hikes slow around the country, but surge again in Seattle. What’s going on? Rents in the Seattle area keep climbing, even though the city is getting a record number of new apartments and rents across the country have stopped growing. Click on the interactive map to see current average rents, and how much they have gone up in the past year in Seattle neighborhoods and other communities. Finally, after several years of punishing rent hikes, the pain is finally coming to an end for renters across the country. New reports show that rents throughout the Seattle area continue to surge at among the highest rates in the country. Meanwhile, other pricey cities like New York and San Francisco are now seeing rents drop, while the average U.S. rent has basically remained flat. The typical rent in King and Snohomish counties in the spring rose 4.6 percent from the winter, and grew 7.6 percent from a year ago, according to figures released Tuesday by Apartment Insights Washington, which surveys apartment owners each quarter. Rent across the two counties now stands at an average of $1,667 across all types of apartments, an all-time high. Rents are up 64 percent since 2010, adding an extra $7,750 a year to the typical renter’s bill. Rents rose in every city across the region, with hot neighborhoods like Belltown, Ballard and Capitol Hill seeing 10 percent rent hikes from a year ago. At the same time, two key indicators of where the rental market is heading — the apartment vacancy rate, and the perks offered by landlords, like a free month’s rent — are moving in the wrong direction for renters. And a separate report by Zillow showed rents locally are rising eight times faster than the national average. But there is a bright side. Rent hikes have at least slowed a bit from the peak increases seen over the previous few years, when it was common for annual growth across the region to exceed 10 percent. Rent growth last quarter was the weakest its been for the spring period since 2013, even if the slowdown was small. The continued rise in rents is especially surprising for two reasons. First, Seattle is undergoing its biggest apartment construction boom ever, with more apartments opening in the last five years than in the previous 25 years combined. That added supply, in theory, should help offset the growing demand from the many new residents flocking here. “We thought the rate of rent increases would drop off a bit this year in the face of all the new construction. That doesn’t seem to be happening, at least at the midyear point,” said Tom Cain, who leads the Apartment Insights Washington survey. He expects the rent hikes to continue. Second, Seattle’s rising rents run counter to the big slowdown in rents across the country so far in 2017. Zillow on Thursday released national data that showed rents across the country were up just 0.7 percent in May compared to a year ago. Among the metro areas where rents dropped slightly from a year ago: San Francisco, New York, Chicago, Philadelphia, Houston, Washington, D.C., Miami, San Jose and Austin. Generally, the areas still seeing significant rent hikes now are places that have traditionally been more affordable and outside of huge job centers, like Tacoma and Sacramento, while pricier cities have mostly topped out on rents. So why is Seattle such an outlier? Cain and Svenja Gudell, Zillow’s chief economist, pointed to a couple key reasons, all of which lead back to the simple economics of demand outpacing supply. Not only is Seattle the fastest-growing big city in the country, it’s bringing in workers with generally well-paid jobs. So even though other cities have had success by building more apartments to slow rents, the construction hasn’t been enough in Seattle, Gudell said. Amazon alone has 9,000 job openings in the city. Seattle is on track to get about 9,000 new apartments this year, easily a record high and more than most other big cities. In a usual market, lots of newcomers with good pay would just buy homes and stay out of the rental market. But home prices are rising faster here than anywhere else in the country — growing even faster than rents — and there is a historic shortage of homes for sale. So many would-be homebuyers are just renting instead. “The renting pool is expanding along the way,” Gudell said. 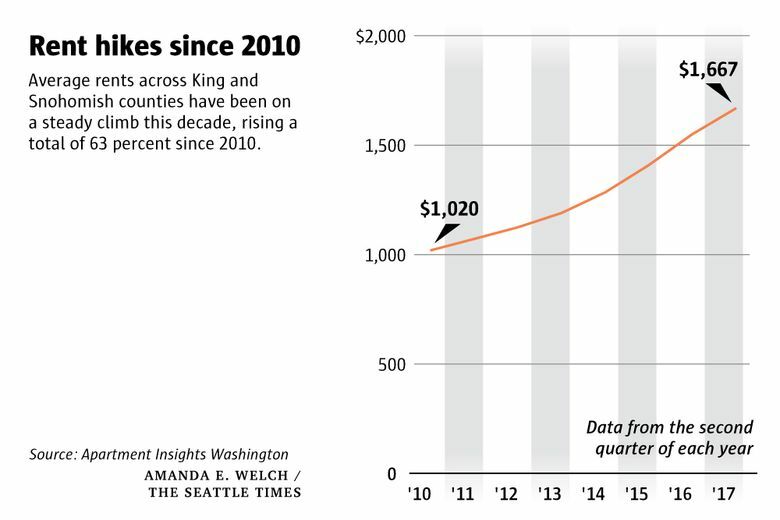 Another factor pushing rents even higher: Property taxes in King County are up 35 percent in the last four years, largely because of initiatives passed by voters. Property taxes here are among the highest in the country, and landlords often pass those extra costs on to renters. Zillow predicts rents regionwide will continue to grow at a similar pace for the next year. Rents are nearly $2,400 in downtown Seattle, the priciest area in the region. After that, the highest average rents are in West Bellevue and South Lake Union (both above $2,220), Belltown ($2,120) and Sammamish/Issaquah ($2,050). Average rents are approaching $2,000 in Fremont/Wallingford, Ballard and Capitol Hill, as well as Kirkland, Redmond and Mercer Island. On the other end, rents are still below $1,300 in a few places, including Burien, Mukilteo, Tukwila, Central Everett and SeaTac. Des Moines has the region’s cheapest rent, at $1,130. Generally, the places with the smallest rent increases now are pricier areas: Downtown Seattle, Fremont, Queen Anne/Magnolia, West Bellevue, Redmond and Mercer Island have all seen rents grow less than 5 percent in the last year. Notably, downtown Seattle — the hottest market for apartment construction, and the priciest market in the region — had rents grow just 2 percent in the last year. And the Eastside’s most expensive area, West Bellevue, had just 3 percent rent growth. 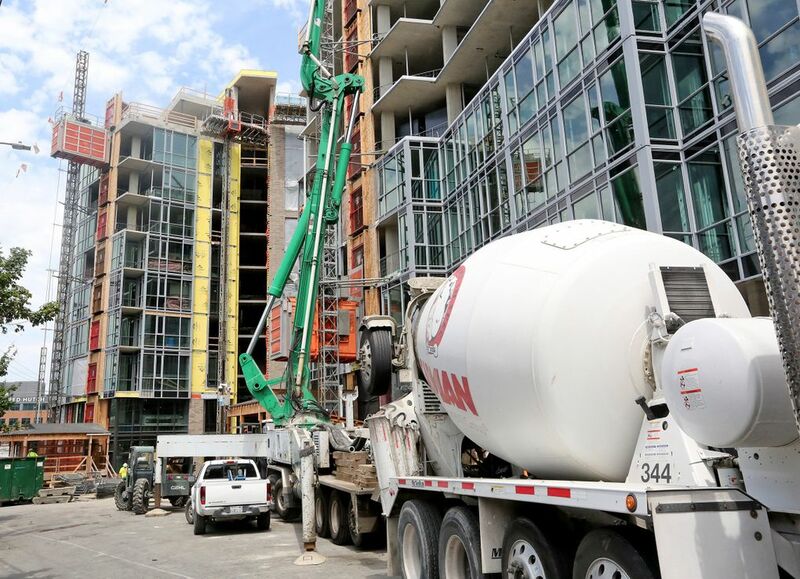 But pricey Belltown, Ballard and Capitol Hill saw rents grow 10 percent, and South Lake Union was right behind, a frustrating development for renters since those neighborhoods also have had lots of new apartments open lately. Other areas with the biggest rent hikes, growing over 10 percent, included some more affordable neighborhoods: First Hill, Central/South Seattle, Edmonds, Mukilteo and Burien. Looking beyond rents, the number of landlords offering financial perks like cheap deposits has dropped from 21 percent last quarter to 14 percent this quarter. The rate of vacant apartments — which helps determine the balance of power between landlords and renters — fell to 4.2 percent, reversing a rise that had been moving in a favorable direction for renters. Last quarter, 4.7 percent of apartments were vacant, the highest in five years for the winter market. Still, the vacancy rate is up from last year’s historically low mark of 3.9 percent.